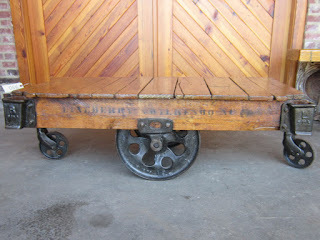 The newest cart that has emerged from the refurbishing shop is this Lineberry cart coffee table with polished cast iron hardware, with the raised cast lettering and side teardrop-style wheels. The beautifully bold authentic stencil is quite strong on both sides of the Oak frame. The antique oak wood top is smooth and has a medium honey blond color.